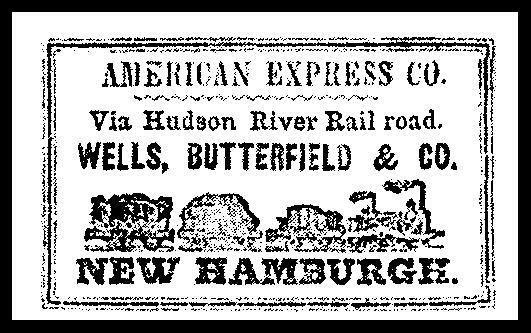 The first widely recognized American private express company was started in Boston, Massachusetts in 1839 by William F. Hamden and it became a very successful business endeavor. 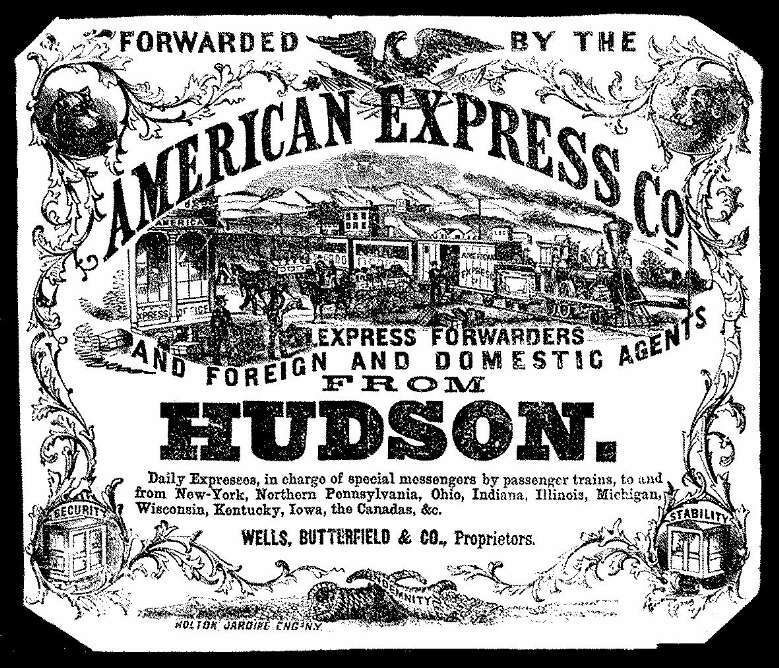 Other Expressmen followed Hamden's enterprising lead resulting in thousands of private express companies in the United States and Canada by the end of the 19th Century. 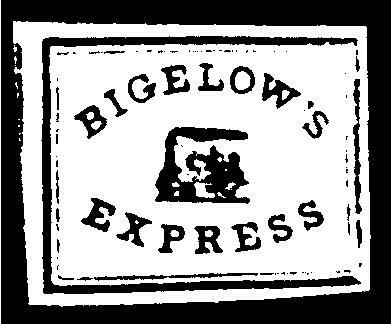 Many of these expresses (and their parcel delivery company 'cousins') issued labels and stamps as part of their normal business operations. 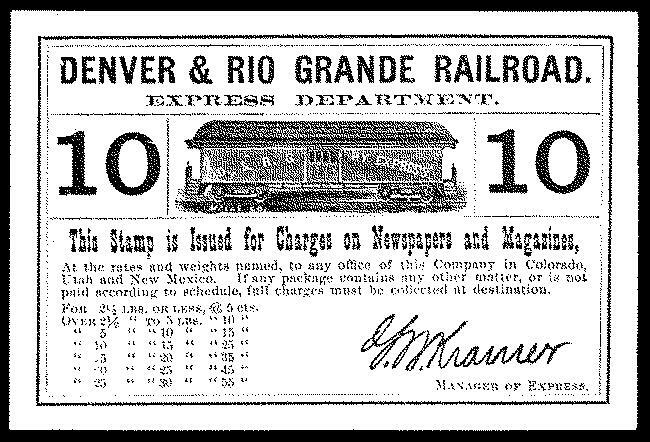 These labels and stamps were used to identify express services and for customers to prepay delivery charges. 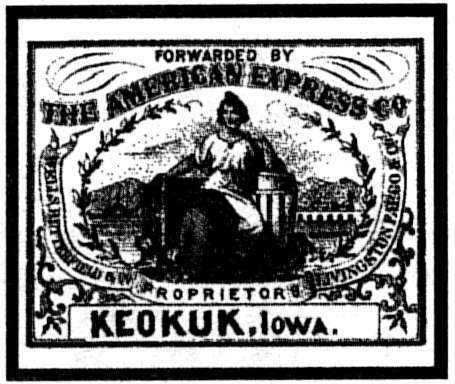 This Catalog lists over 2000 of the many private labels and stamps that were issued in the first 85 years of the express business in North America. 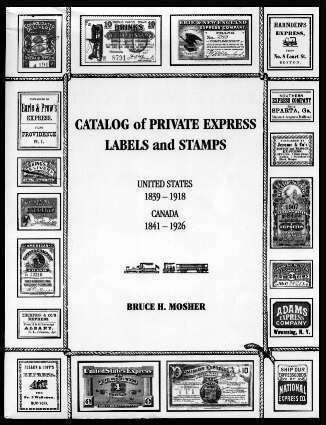 Bruce H. Mosher, Author of the Catalog of Private Express Labels and Stamps, has been collecting and researching United States and Canada private express material for over ten years. He is a former Express Section Editor for The Penny Post and has had several articles published in philatelic journals that chronicle the history of express companies, their labels, and their stamps. 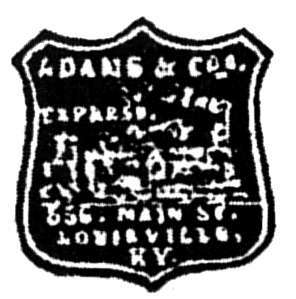 He is a long time member of the American Philatelic Society, the American Revenue Association, the Western Cover Society, and the Carriers and Locals Society. See also, this review by Richard Frajola. 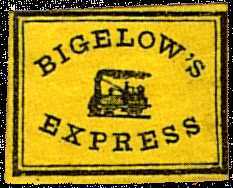 I have been interested in Express Labels and Stamps ever since I started writing the train-related pages of this website, and learned from viewers that there were a lot of private issues that I needed to know about and display. But I was frustrated by the difficulty of obtaining even information, let alone images or actual examples of the material. So I did the best I could with what I could find, and left it at that. You can see the result of my efforts on my original page of Trains on US Expresses and Locals. Fortunately, the author of this catalog found that page, and wrote to ask if I would be interested in buying his book. I was, and once I saw what a fantastic job he had done, I asked if he would permit me to scan and display his images and text here. He not only consented, he volunteered to send his original scans. 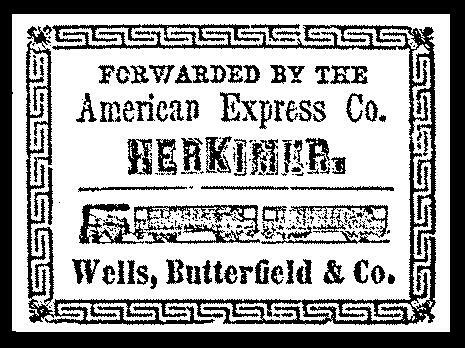 So now, thanks to his generosity, I can share his findings with my fellow rail philately enthusiasts. Let me point out right away that most of these items have no philatelic connection, i.e. they did not show payment of fees. As Mr. Mosher explains in his book, one reason for their use was to help assure that a package would be routed properly to its destination, or back to its source if it got lost. 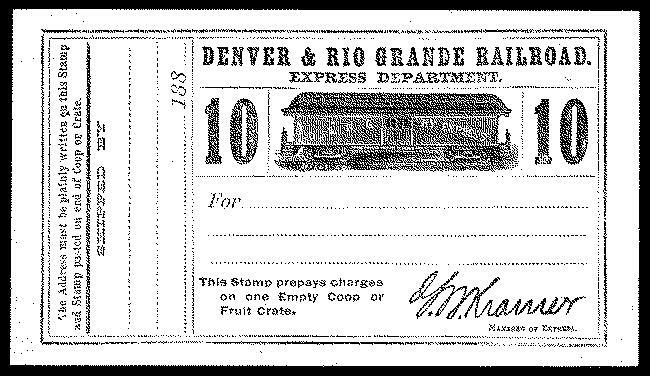 So to a stamp collector they are Cinderellas, at best; but to a rail enthusiast they are cherished relics of an important period in railroad history, and to me they belong in a rail philatelic collection, as key peripheral documents. 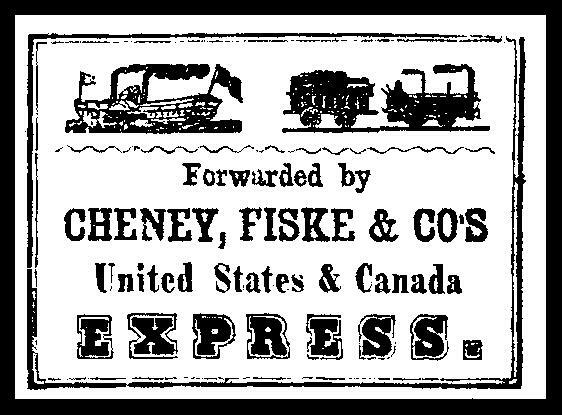 Below are all the items from Mr. Mosher's catalog that depict a train, locomotive, or rail vehicle. Note that his book shows many more labels with a rail connection, but I have chosen to feature only those that actually picture rail equipment. I include descriptive data, but not the pricing. I have used Mr. Mosher's notation scheme, as well as his images; indeed, ALL the images and text below are from his book, with the exception of the "Equipment" notes - I added those, and take sole responsibliity for their content, as well as for any other errors I may have introduced in the process of creating these pages. 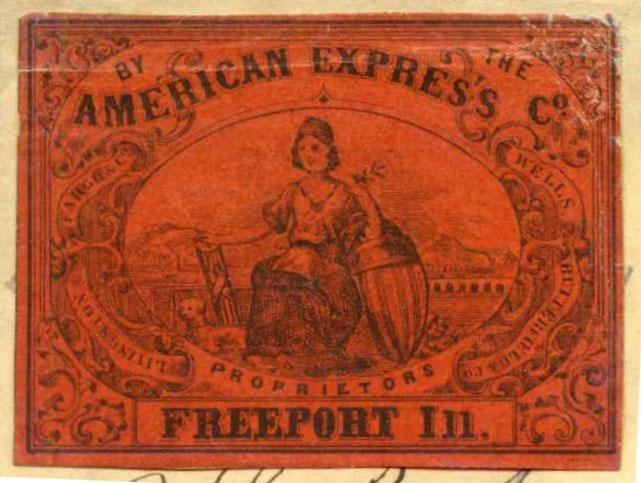 Private express labels and stamps are not offered very often by any dealers or auction houses, nor are there (to my knowledge) any specialty dealers. Finding examples with trains on them is even more difficult. I search my favorite sources rather regularly and not many opportunities come along. Also, as you can probably tell, I'm an active collector of this material, so I'm very reluctant to divulge the few sources that I've cultivated over the last ten years of collecting these elusive items. Do you receive the Nutmeg auction catalogues? If not see their website at http://www.nutmegstamp.com See (for example) lot 8049 in Nutmeg sale #52 which takes place September 5th. 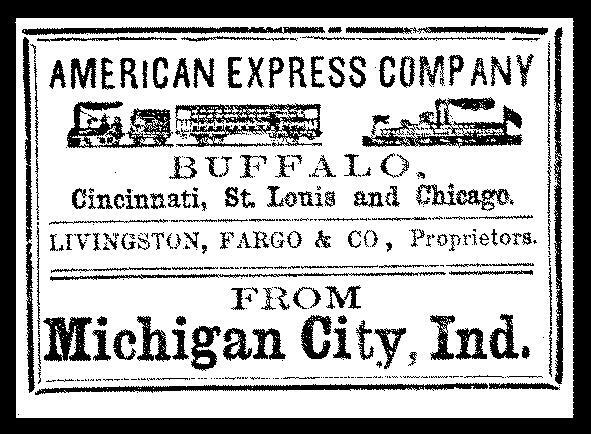 Description; The National Express Co, formerly Pullen, Virgil & Co. illustrated shipping document, Glenn Falls NY, dated June 25, 1856, marked for Jacksonville, Iowa, nice train design, VF Ext = $120 Indeed lots 7990 - 8102 are all Express Co. labels etc. At the bottom of the page is information on how you can order a copy of this wonderful book. 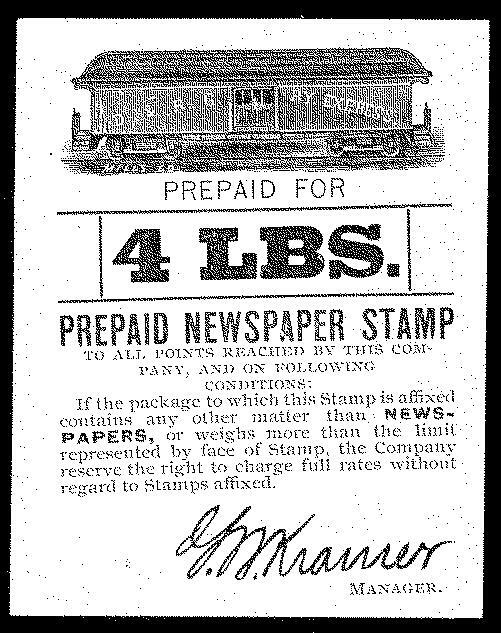 It contains far more information than I have presented here, about the history and use of these labels and stamps, and about the companies that used them. My main goal was to display the stamps themselves, for their rail connection, so I will leave it to the viewer to get a copy of the book, if you want to know more. Please e-mail me at if you can provide additional information about any item, especially the equipment shown. COLOR - the two colors following this title represent the ink and paper. So "Black/Orange" means the item was printed with black ink on orange paper. EQUIPMENT - these notes are very crude at present. If you can provide more specific data, please do so. The terms "very early" and "early" are somewhat arbitrary, but in general refer to designs of the 1820's, 1830's and early 1840's. On early steam locomotives, the driver or engineer stood exposed at the rear, while both baggage/freightand passenger cars were open to the elements. 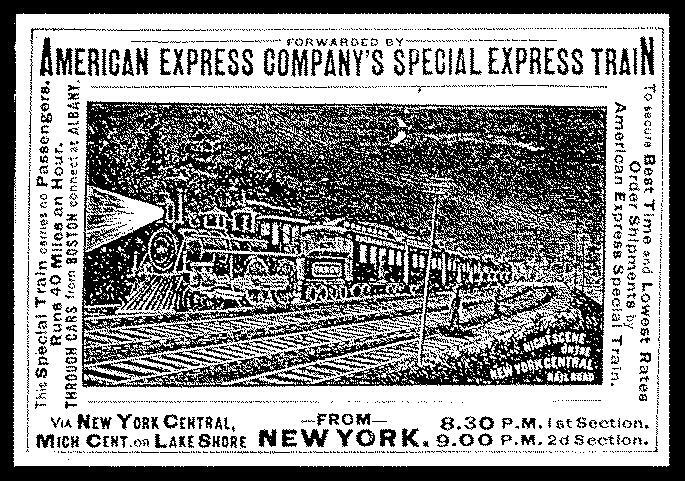 By the 1850's locomotives had enclosed cabs. First Class passenger cars were enclosed fairly early, even in the 1830's, while second class and steerage remained open into the 1840s. Everything had to be enclosed eventually, since the higher speeds, plus the danger of fire from sparks made travel too hazardous otherwise. IMAGE SIZE - Illustrations are not to scale relative to each other. Read the Size entries to obtain actual and relative sizes. The "ww x hh mm" entries define the outer dimensions of frame rectangles, or other measurable design extremes. "O/A ww x hh mm" entries define the overall paper size of a label/stamp or booklet cover when no design extremes are easily measureable. Unknown sizes are marked "Unknown". Uncertain dimensions are followed by a question mark. 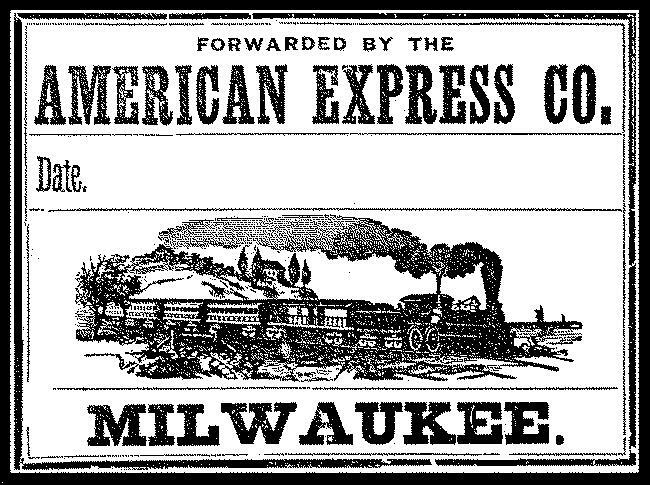 Started in 1841 by Alvin Adams in Boston, Mass. 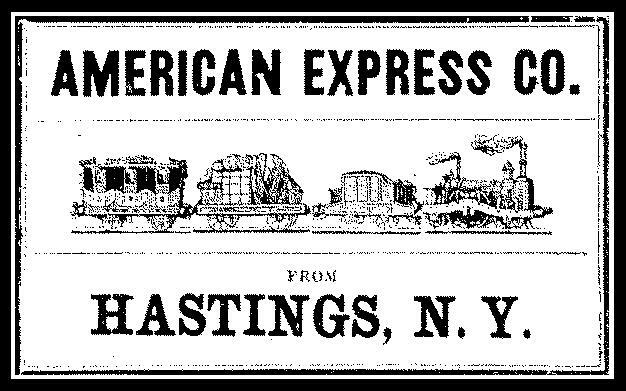 Operated as a private mail and regional/parcel express company mainly in the Eastern states and California. Also known as "Adams & Co." and "Adams Package Express." This company was terminated on February 23, 1855. Succeeded by Adams Express Company. Equipment: I thought it was just my imagination, but I saw a locomotive with steam coming out of its balloon stack here, and probably a tender and freight car. Bruce has confirmed that the description he was given of the item says "Locomotive in center", so score one for a good imagination. 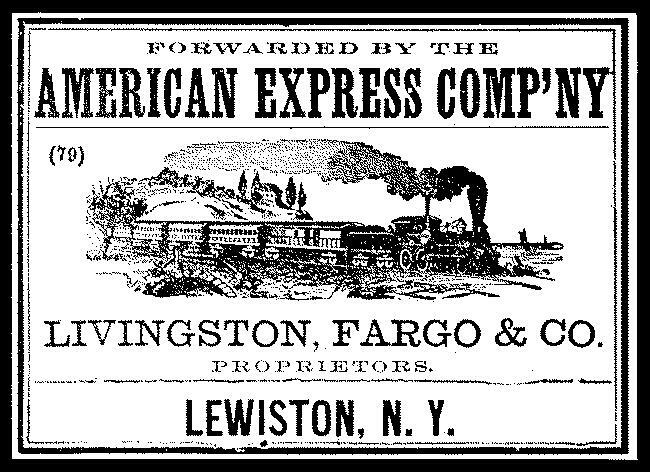 Formed on March 18, 1850 in Buffalo, NY by the merger of Livingston, Fargo and Company, Wells and Co., and the Butterfield and Wasson express operations, American Express was a regional private mail and parcel express company. 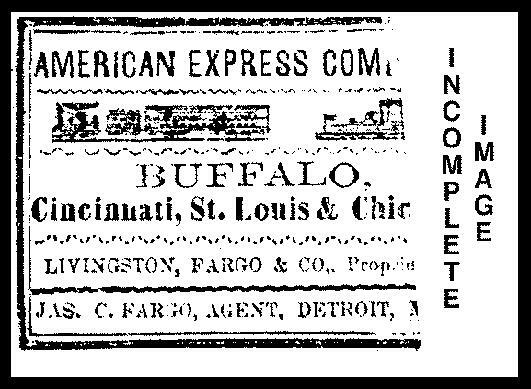 Until about 1868, proprietors Livingston, Fargo and Co. conducted American's express business west of Buffalo, NY and proprietors Wells, Butterfield and Co. performed American's business east of Buffalo. 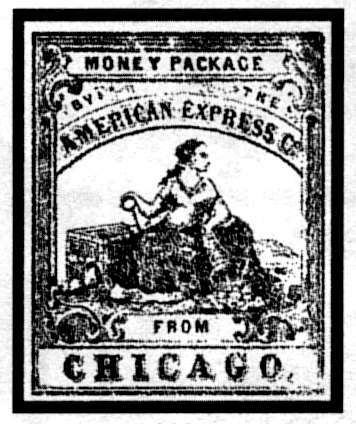 These proprietor names appear on many early American Express labels. 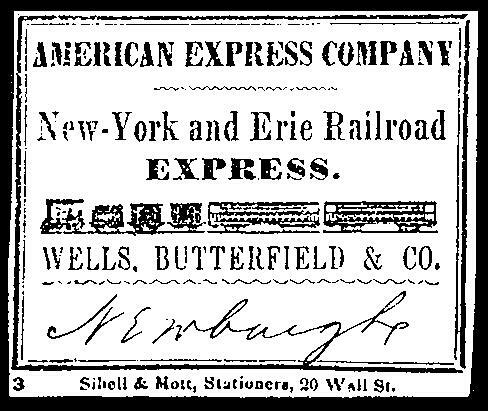 From December 1, 1868 to January 31, 1873 this company and its proprietors became the American Merchants Union Express after merging with their competitor Merchants Union Express Co. After this period the company name reverted to the American Express Co., which has persisted to the present. 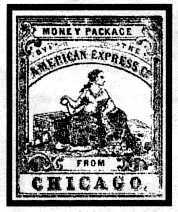 American Express became one of the four largest U.S. express companies ever, with mainly northern operations throughout the eastern and mid-western states and into Canada. 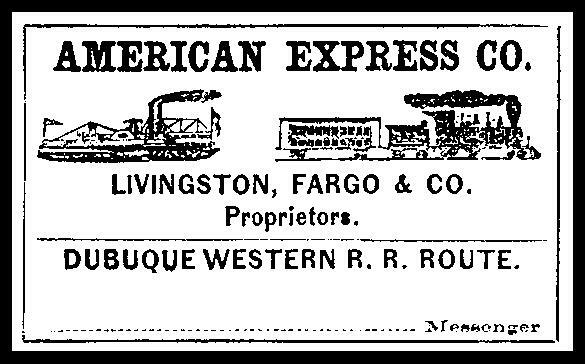 The package express business portion of this company ended and was absorbed by the American Railway Express Co. on July 1, 1918 by federal proclamation. 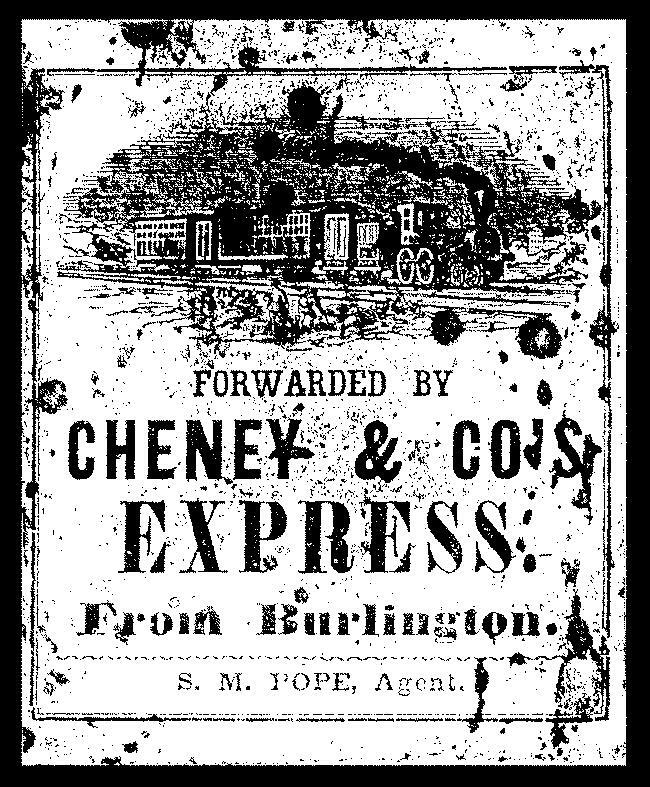 Equipment: Based on the illustration in Bruce's book (upper image at left), and similar images from the period, I was convinced this item showed the front of a tiny steam locomotive emerging from the bottom of the female figure's robe, at the bottom right (click on the image to view an enlarged version). I presume the allegorical female figure is "Commerce", or something of the sort, they were fond of those allegorical figures back then. To see what I mean about "similar images of the period", look at the Civil War patriotic envelopes on this page. But then Bruce sent the color image, and the locomotive disappeared - well, sort of - I can still see it if I try. So sometimes a train, like beauty, is in the eye of the beholder. Click here to see another example of this phenomenon. 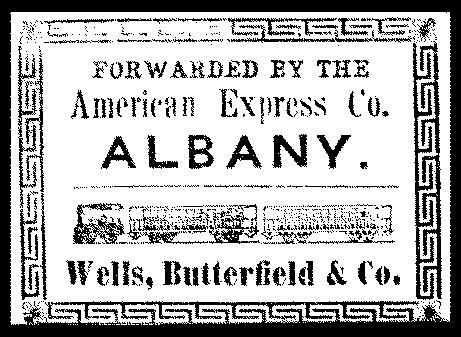 Equipment: Very early steam locomotive with tender, baggage/freight car, and passenger car. Can any viewer identify the locomotive? It looks similar to others I know, but not exactly any of them. There's enough detail it should be possible to name it, assuming the drawing was based on a real model. 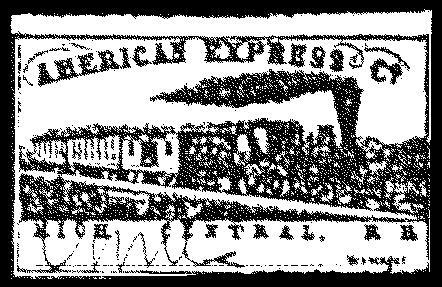 Equipment: By itself, this image is too crude to say more than it looks like the ubiquitous classic 4-4-0 with tender, baggage/freight car, and passenger cars, but it is clearly just a variant of the 4-4-0 image used on many of the American Express labels that depict a train. 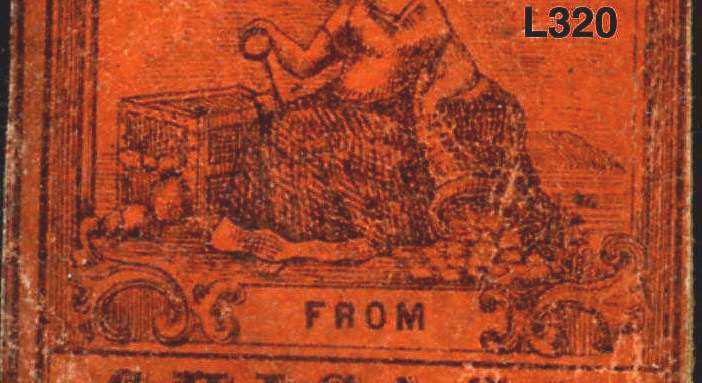 Equipment: Tiny train crossing viaduct/bridge at lower right side of seated female figure (see text for AMEX-L320, above). Equipment: Early (fanciful?) 2- 2-2 with baggage/freight car? 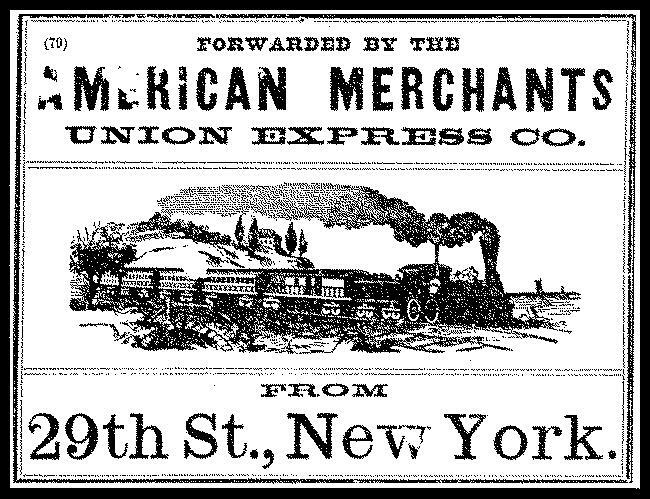 On December 1, 1868 the Merchants Union Express Company merged with their chief competitor, American Express Co., to form this company. 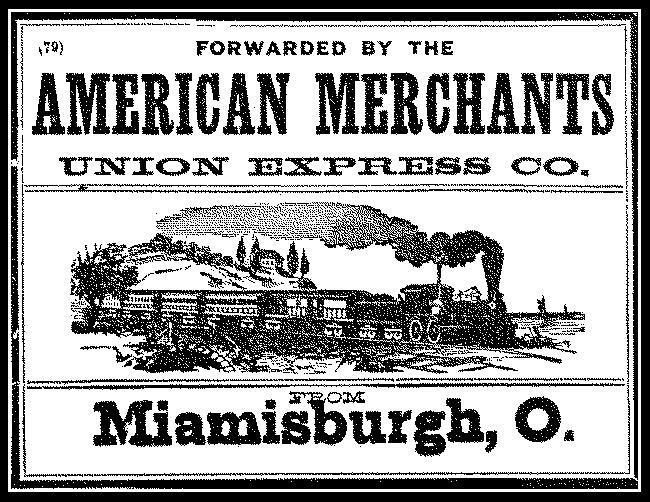 American Merchants Union Express was a regional private mail and parcel express company. 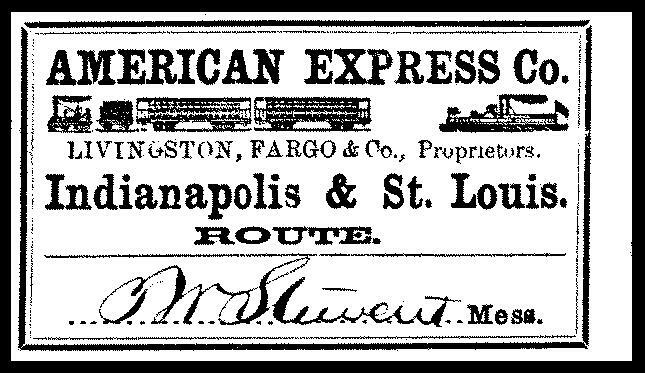 It was managed by former American Express officials and provided mainly northern express operations throughout the eastern and midwestern states and into Canada. 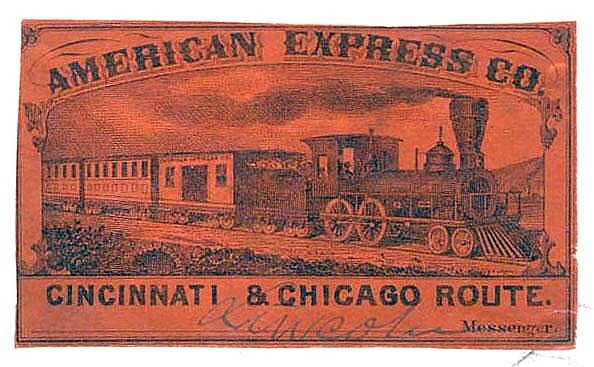 On February 1, 1873 the company name reverted to the American Express Co. 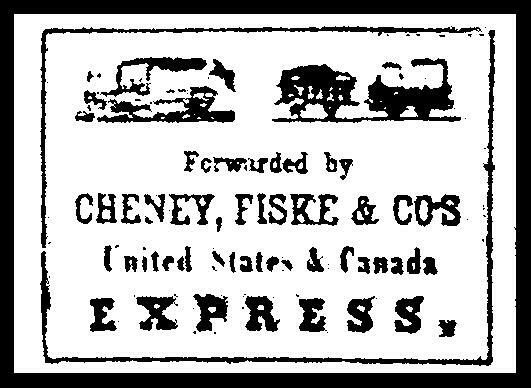 Regional parcel express company that operated between Boston, Mass. 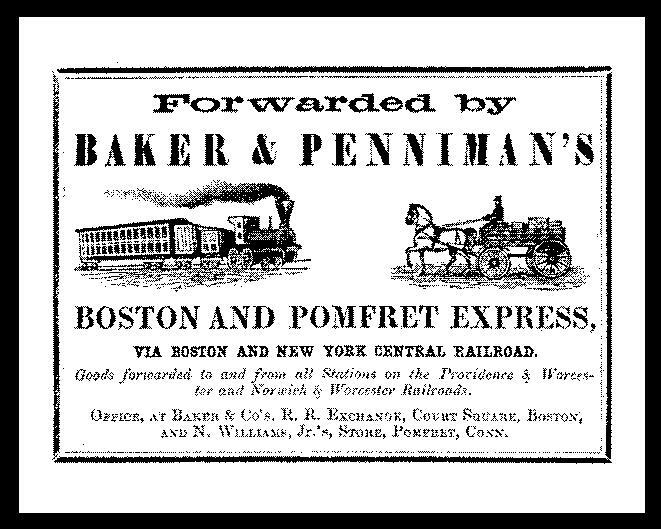 and Pomfret, Conn. via the Boston and New York Central Railroad (1853-58). 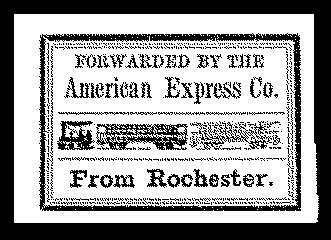 This company also provided express service between all Norwich & Worcester Railroad stations and all Providence & Worcester Railroad stations. Regional private mail and parcel(?) 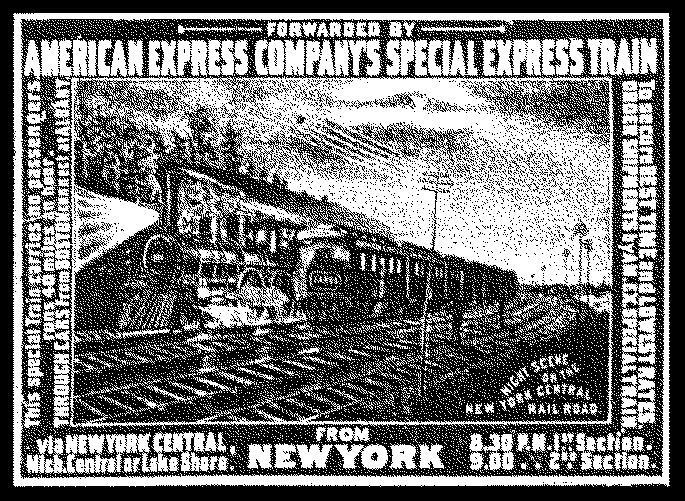 express company that operated between Boston and other towns in Mass., Maine, NH, Vermont, plus Montreal. 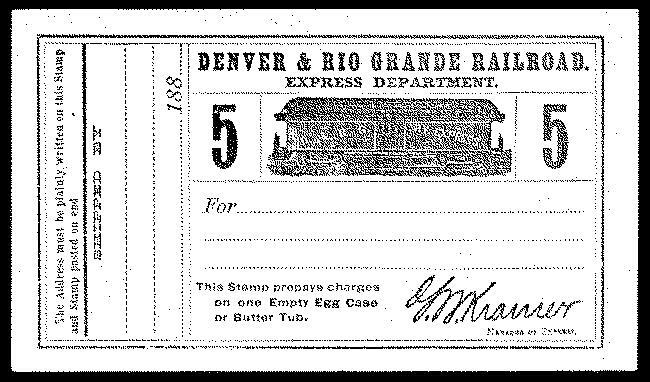 Purchased by Fiske & Rice on March 1, 1851. Equipment: Very early steam locomotive - resembles "The Experiment". See my Trains on US locals and Expresses page. 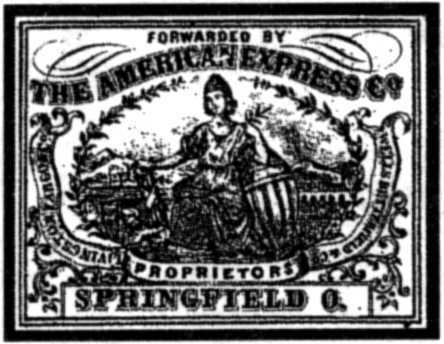 Regional private mail and parcel express company that operated between Boston, Mass. and towns in NH and Vermont plus Montreal. 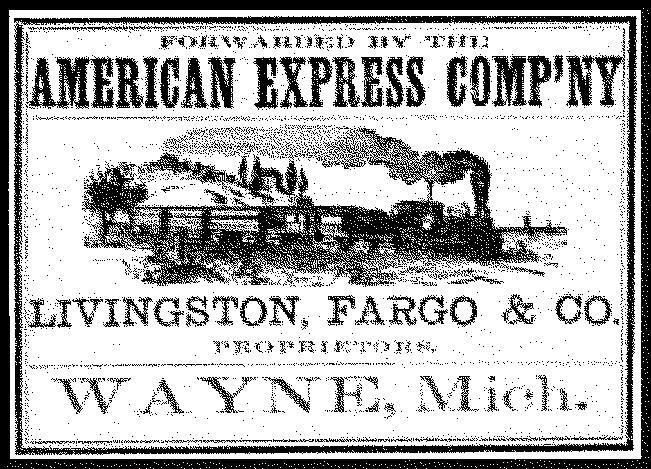 In 1846 this company became proprietor of the United States and Canada Express. 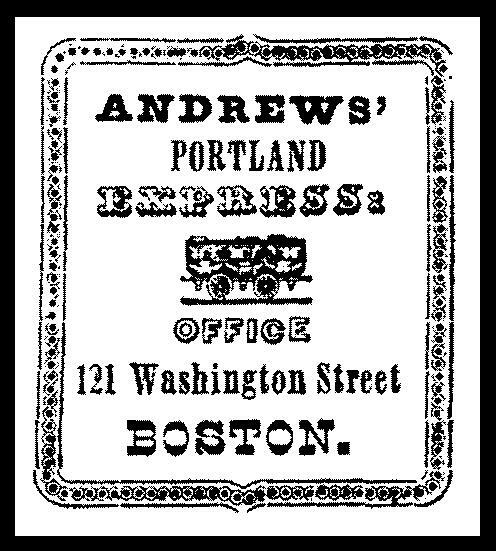 Regional private mail and parcel express company that operated between Boston, Mass. and towns in NH and Vermont plus Montreal. 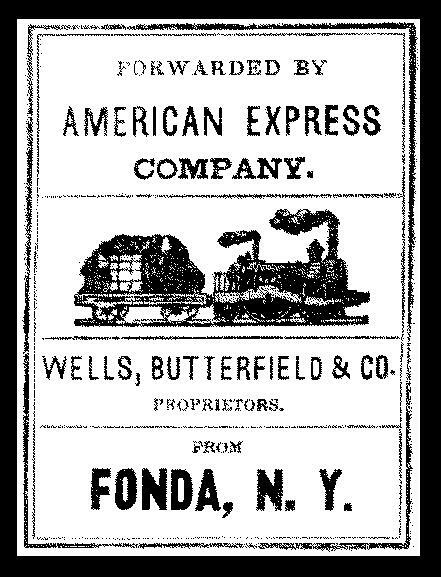 Proprietor of the United States and Canada Express. 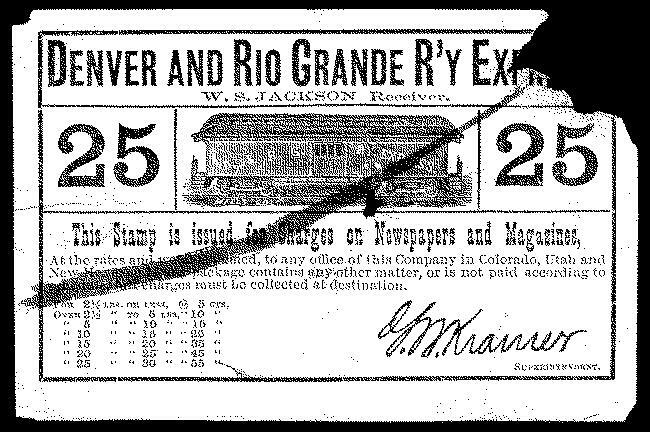 Regional private mail and parcel express company that operated between stations on the Denver & Rio Grande Railway/Railroad (1870-1921) and other mostly small roads operating in Colorado, Utah, northern New Mexico and southern Wyoming.